Was it really first made by Neapolitan prostitutes who needed a quick dinner? Who knows. Who cares. It's delicious! Process the tomatoes until chopped but not pureed. Scrape out into a mesh strainer over a bowl and let drain, pressing down solids as needed. Start the water for the pasta and begin cooking when it boils. Mix oil through oregano a small bowl. In a large skillet, cook the garlic mixture over medium heat, stirring for 2 minutes. Add tomato liquid a simmer for 2 more minutes. 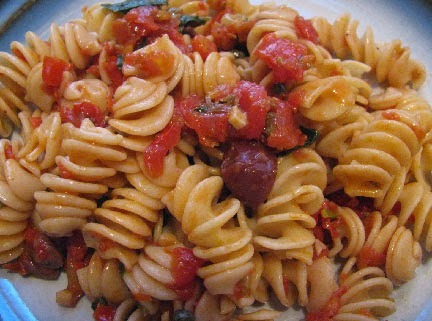 Add chopped tomatoes, olives and capers and cook for 2 more minutes. Stir in the parsley and keep the sauce warm. Drain the pasta, reserving 1 c of the liquid. Return the pasta to the pot and top with the tomato sauce. Add as much liquid as needed and reheat gently if needed. Serve immediately.